Is Biotech a Bubble in Hong Kong Markets Now? On September 17, a Chinese biotech stock suddenly plunged as much as 47 percent in Hong Kong, attracting more turnover in the morning session than most stocks do in an entire day. While Genscript Biotech Corp had pared losses to 27 percent before trading was suspended at 11:32 a.m., the decline wiped off about $1 billion from the company’s market value. The tumble comes just months after Hong Kong’s exchange operator said it would welcome companies with no record of profit or revenue to list, announcing plans to lure early-stage drug developers from China to the city. But the first biotech firm to take advantage of the new rules - Ascletis Pharma Inc has lost more than 40 percent since its debut, while a vaccine scandal in China has weighed on the health care sector more broadly. Mainland Chinese companies including smartphone manufacturer Xiaomi and mobile infrastructure giant China Tower are among those that have gone public this year in Hong Kong, and more are on the way. Hong Kong topped global rankings for initial public offering volumes in the first half of 2018 and is expected to keep that crown for the entire year. Recent regulatory changes in China have led to an outpouring of enthusiasm from investors and biopharmaceutical companies looking to gain a foothold in one of the world’s major markets - a market that was, until recently, stymied by restrictions that barred pre-revenue biotech firms from listing on the Hong Kong stock exchange. The new listing rules enable Hong Kong to capitalise on opportunities from the up-and-coming biotech companies, which make up a majority of pre-revenue companies seeking a listing. The Stock Exchange has introduced a new Chapter 18A of the Listing Rules to allow the listing of biotech companies that do not meet the financial eligibility tests, including companies with no revenue or profit. Basic requirements include having a core product beyond concept stage with R&D track record over 12 months. The biotech sector being a traditionally highly regulated industry, the new rules allow Hong Kong to adopt a cautious approach before expanding the regime to apply to pre-revenue companies in other sectors. For pharmaceutical and biologics, this would generally mean completing Phase I clinical trials and FDA has no objection for the applicant to commence Phase II clinical trials. Those companies are all pre-revenue and the usual use of funds are to commercialize the drugs. Ascletis Pharma was the first to list under Chapter 18A and the transaction has set a precedent; it sets the standard forms for other biotech companies seeking to list in Hong Kong. Ascletis Pharma completed a $400 million IPO at a $2 billion market cap. The company priced the offering at the midpoint of the range and closed its first day of trading at the IPO price. Ascletis has developed treatment for hepatitis C virus. Founded in 2011, Ascletis raised US$100 million last year through a private share sale led by C-Bridge, a mainland-focused health care fund backed by mainland pharmaceutical firms and other institutional investors. Goldman Sachs and Qianhai Equity Investment Fund have also invested in the fund. In 2015, Ascletis raised US$55 million from Goldman and C-Bridge. 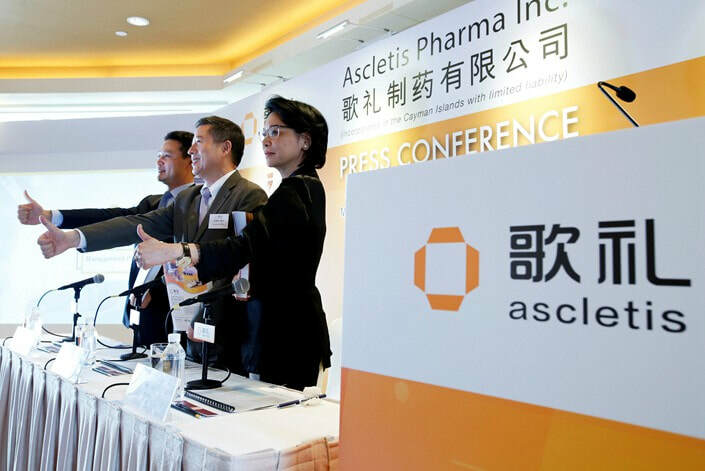 Morgan Stanley, Goldman Sachs and China Merchants Securities are the joint sponsors of Ascletis’ initial public offering. Since the IPO, shares of Ascletis Pharma Inc have fallen by more than half, lowering the company’s market capitalization to $868 million. The Hangzhou-headquartered firm, which is developing drugs to treat HIV, hepatitis C and other diseases, raised $400 million in its IPO. The Hong Kong shares of cancer-drug developer BeiGene Ltd. (6160.HK) have also fallen more than 30% since they began trading in August. BeiGene, which has offices in China and the U.S. and is also listed on Nasdaq, had raised $903 million for a second listing in the city. Separately, shares of Shanghai-based Hua Medicine (2552.HK), which went public in Hong Kong in September and is focused on diabetes treatments, have fallen nearly 12%. I think It’s always risky to invest in pre-revenue biotech firms because what they are working on is innovative. 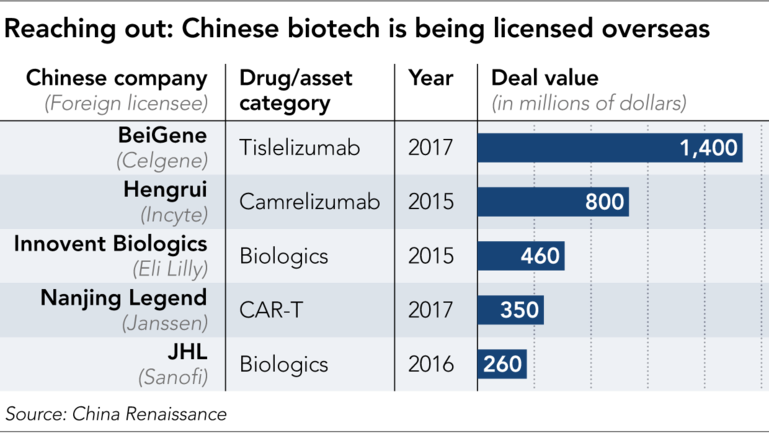 JPMorgan analysts forecast China’s biologics industry to double in size to $50 billion by 2020 with a global growth rate of 60 percent. Nonetheless, the stock has been down 30 percent. I think it was partially caused by poor market sentiments dragged down by trade war tensions, and it might be as collateral damage of recent vaccine scandals in China. Despite a tariff war between China and the U.S., Reuters noted that there is not likely to be any slacking off of partnerships between companies from the U.S. and China any time soon. Especially when growth projections show the massive gains China will make in its market value. IQVIA data shows China’s pharmaceutical market is expected to grow to between $145 billion and $175 billion by 2022. Biotechs started out on a strong note in 2018. Healthcare was the best sector in the CSI 300 index of shares traded in Shanghai and Shenzhen, climbing 26 percent through the end of May while the entire market fell 5.7 percent. Investors poured into the $122 billion drug industry as the government sought to overhaul regulations that had for decades slowed drug approvals and stifled innovation, with the aim of building homegrown champions. This big idea has translated into an investment boom. Last year, biotech startups in China, broadly defined, raised almost $30 billion, according to data from McKinsey. And while venture inflows in other Chinese tech sectors have slowed, $32 billion was raised in the first half of this year, suggesting that 2018 will break last year's record. International private equity firms such as General Atlantic and Warburg Pincus have also become big investors in the sector. Another interesting example is JHL Biotech Inc., a Taiwan-based developer of cheaper alternative cancer drugs, which has raised a new round of financing at a valuation of about $750 million last month. Most of the funding came from existing investors including French pharmaceutical giant Sanofi. Proceeds will go toward ongoing development of JHL Biotech pipeline of drug candidates that are in phase III clinical trials. JHL Biotech, which was founded in 2012, is planning a Hong Kong IPO as soon as next year. It would join fellow biotechnology firms Ascletis Pharma Inc. and BeiGene Ltd., which sold shares in Hong Kong this year after the city made it easier for early-stage drug companies to list.